The manufacturers of Hemorrid, a hemorrhoid treatment, claim that their product combats hemorrhoid pain and flair up and is all natural, even down to the capsule being made from natural plants. 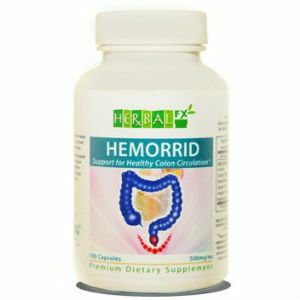 While the holistic aspect is intr++iguing, the makers of Hemorrid also claim that it treats hemorrhoids in three ways. One, it has ingredients that promote healthy vein regrowth and circulation. Two, the product includes a treatment for easy bowel movement. And three, the included supplement aids in digestion. So the makers of Hemorrid claim that this three-tiered strategy for treatment is a holistic method to regain lost health due to poor exercise and living habits, such as diet and alcohol consmption. Selected for its antimicrobial, antiviral, anti-fungal, and anti inflammatory-properties. It is a common ingredient in formulas treating irritable bowel disorder. A common diuretic which treats diarrhea, fatigue, lack of appetite, and edema. Used as a tonifying ingredient to help reduce fatigue, lack of appetite, and loose stools due to a weak digestive system. Reputed to tonify the blood. Promotes the circulation of blood. Said to have natural anti-inflammatory properties and a good source of vitamin B12. There are no known side effects reported from the use of Hemorrid, and the recommended dosage is three to four capsules twice per day. Hemorrid comes in bottles containing 100 capsules and can be purchased online for approximately $49.00 per bottle (sale price, regularly $59). If you take the recommended dosage then your first bottle is a half months supply. The Hemorrid makers guarantee their product, but will only accept unopened bottles for return; the company further requires that you enclose your packing slip or a copy of your order when you return their product. John Parker	reviewed Hemorrid Review	on October 22nd	 and gave it a rating of 3.